EBBP is short for Euro Blogging by Post. This time it was Jeanne from Cook Sister organizing it! I first came across this event on Andrew's blog and found it exciting. What it simply is, is a few bloggers living in Europe getting together and sending a parcel filled with something according to the theme. This time it was appropriately A taste of summer. As you can see what I interpreted under this. My homemade pineapple and yellow plum preserve (recipe will follow shortly), a wonderful Honey cake to spread the preserve on and my fave chocolate - Chili and Almond! 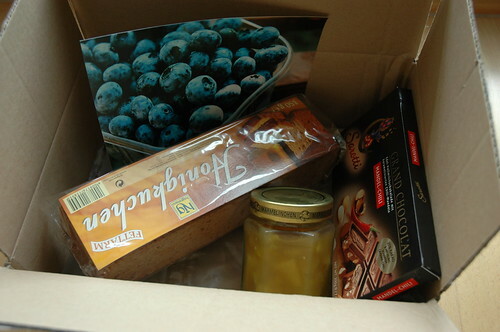 Oh and my parcel is not complete without a wonderful photo of some summery blueberries from yours truely! These are just a few of the things that keep me in the summer mood this season. The spread is so fruity and tasty and with the honey cake it bursts with lovely flavour. In the evenings I love to sit outside and nibble on this lovely chocolate with a slightly spicey taste. My parcel is off .... I think I won't reveal just yet where. Thought I'll make a little game out of this. Can you guess where? A little hint ... further up north to where I live! My parcel arrived! It was Anne of Anne's food all the way up in Sweden. Anne I am glad you liked my offerings to you. See you around! Well I guess that isnt coming to me then! Shame, looks delightful. Oooh, some recipient is in luck! Looks wonderful! YAHHHH! I am so glad you got it! I think this is my limit to excitment afte the postcard event and the parcel event I am all exhausted on excitement. Anne I am glad you liked it!! I love it - wow, that chocolate is totally addictive. And the photo is absolutely incredible. Haven't tried the other two things just yet, but will very soon :) I've blogged about it now, too! I know that chocolate is too wild! I have to be so careful when I buy it because it never really lasts very long. Chili and almond is a strange combination but gosh it tastes so good, doesn't it? Hope you take a few nibbles for me ... I am all out! !